Comedian and actor Ricky Gervais - who some people believe is vegan - has won Humane Society International's first ever 'Cecil Award'. The award is named after Cecil the Lion, whose death at the hands of American Dentist Walter Palmer sparked despair and fury globally, and shone a spotlight on the barbarity of 'trophy hunting'. According to HSI, Gervais used his platform to raise awareness around Cecil's death as well as other animal issues including dog adoption, ending the fur trade, animal testing for cosmetics, the international dog meat trade, and the exploitation of animals for entertainment such as bullfighting. While Gervais has spoken out about not eating animals before, and was described as vegetarian by InStyle he hasn't ever said he is vegan - and even spoke about his love for cheese in a 2014 interview with Bon Apetit magazine. However, rumors that he ditched all animal products abounded after his early 2017 appearance on Hot Ones where he was interviewed by Sean Evans. The format sees stars eat increasingly spicy chicken wings until they can't handle the heat anymore. In the episode, host Evans says: "We're going further for Gervais - we're going vegan. I'm going vegan too." They also spoke about cheese, with Gervais saying he 'used' to have it. "When I used to have cheese and beans on toast, it was always a mature Cheddar," he said - leading one article to conclude that 'Ricky Gervais is now officially vegan'. 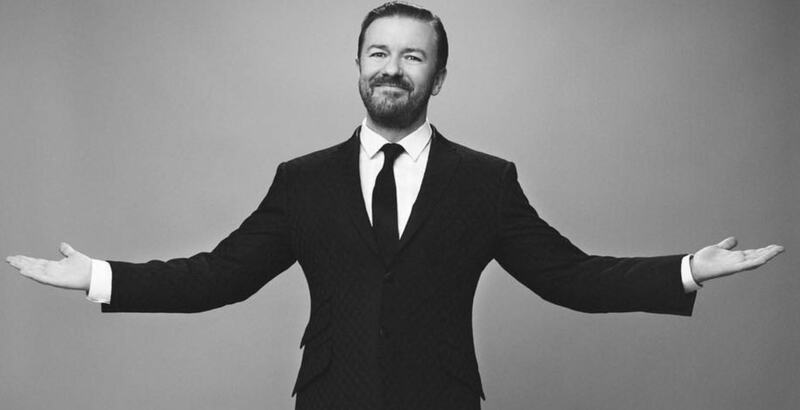 Writing about the award, HSI President Kitty Block said: "Ricky Gervais's voice has reached out over the years to his millions of fans over social media and through the media, elevating the work we do in raising global awareness about trophy hunting. "Over the years...Ricky's voice has continued to reach out to his millions of fans over social media and through the media, elevating the work we do in raising global awareness about trophy hunting... adding to the momentum to ending it for good." "Thank you for my lovely award," Gervais Tweeted. "Keep up the great work."